After orthodontic treatment is completed at the orthodontic office of Lisa P. Howard DDS MS, retainers are the finishing touch to maintain your beautiful new smile while the teeth stabilize and over a lifetime of good oral health. An orthodontic retainer is a custom-fit device that is removable or bonded depending upon the patient’s individual needs. It is your insurance policy your teeth stay put in their new positions if worn as instructed. The bone structure and tissue around each individual tooth needs to stabilize after braces are removed. When wearing removable retainers, we require patients to wear retainers both day and night the first few months, except during meal times and for brushing and flossing. Taking care of retainers during this time is important since they can easily be lost or broken when out of the mouth and not properly stored in their case. After the bone and gum tissues stabilize, your doctor will instruct you when you can wear your retainer nights only. After night time wear for approximately a year, you can then reduce wear to a couple of nights off each week, indefinitely. We do not recommend you ever stop wearing retainers. Teeth move throughout life as part of the natural aging process. Wearing your retainer a few nights a week, indefinitely, will keep that beautiful smile over a lifetime of good oral health. 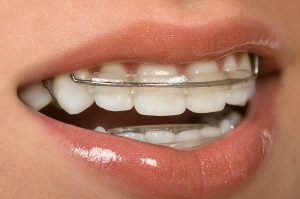 There are many different types of retainers available today. The retainers prescribed at the office of Lisa P. Howard DDS MS is based on your personalized treatment plan when your appliances are removed. Removable clear plastic retainers are often used immediately following the removal of your braces. They can also be used for night time wear. Some patients require a removable retainer with a single wire to prevent movement of more extensive corrections for crowded and rotated teeth. Bonded retainers on the inside of teeth called lingual retainers don’t show at all. They are not removable so you can’t lose them. However, it can prove to be an issue with brushing and flossing over long periods of time. Good oral hygiene and regular visits to your general dentist for cleaning are important when wearing this type of appliance. Which type of retainer is used depends on what your teeth looked like before you started and what is needed at the end of treatment to maintain your correction long term. This decision will be made by your orthodontist. Retainers are an investment in your smile over a lifetime. If you fail to wear it as prescribed, especially when first removed, the tissue and bone surrounding teeth will be unsupported during the stabilization process allowing the teeth to move. Not following instructions may result in noticeable shifting of the teeth. You have come too far creating your beautiful smile — wear your retainers and keep it that way!